Products made with the ancients grains of Quinoa and Amaranth. High nutritive values for a healthier life. Qualified and certified products from micro-farmers in Ecuador. Ingredients come from one of the highest cities above sea level in the world, Quito-Ecuador. QUNTU are unique, delicious and ready to eat products made with the ancients grains of Quinoa and Amaranth, which are considered two of the “world’s healthiest food. 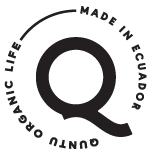 In the process of our products, we only use natural and organic ingredients that come all the way from one of the highest cities above sea level in the world, Quito-Ecuador. We consider organic agriculture the best and only way of sustainable food production that not only helps the well-being of the soil, but also ensures consumption of foods with high nutritive values, resulting in a healthier life.